Custom materials in SOLIDWORKS are important if you are using materials not included in the default set. Around a decade ago, Chris Saller compiled a bunch of such custom materials from varies sources based on requests and submissions from many different people. This list is informally known as Ctopher’s Custom Material Database, “ctopher” being Chris’ handle. Various versions of this file have been available on now long-gone websites over the years. Well, the material database is finally back and bigger (better) than ever! Chris has complied a new version in SOLIDWORKS 2016. This new version has many new materials. The new database is now available directly on SolidWorks Legion in the File Downloads tab as Ctopher’s Custom Material Database. There are two methods to point SOLIDWORKS to use a custom material database. The easiest method is described on Ctopher’s Custom Material Database download page. Below is a slightly more advanced method which should also work on networks. 1.To use, place custom_matls_091516_sw2016.sldmat file into an easily accessible folder, such as S:\SOLIDWORKS Shared File\Custom Materials. The folder is your choice, based on your network and operational set up. 3.Goto Tools>Options…>System Options>File Locations. 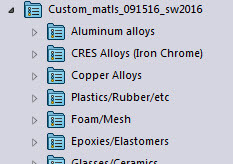 In the Show folders for dropdown, select Material Databases. 4.Select Add button. Navigate to your chosen folder, such as S:\SOLIDWORKS Shared File\Custom Materials. 6.Repeat for all instances of SOLIDWORKS within the network that need to access this database. 2.In the Feature Tree, right click on Materials and then select Edit Materials. “Custom_matls_091516” folder will be on your material list. 4.Click on desired subfolder, such as Copper Alloys. 5.Click on desired material to view properties. 6.Click on Apply to apply that material to your part. 7.Click on Close to return to your part.